You can use bright light therapy alone or in combination with antidepressant drugs. For informaion on bright light therapy for different tpes of depression, or for elderly, and more options, see Here How You Can Beat Depression, Anxiety, Sleep issues with Light. Now there's also a device that brings light therapy to the brain via ear buds. Here's more on the Human Charger. This mobile app for your iPhone has been introduced by the Dovivo company. 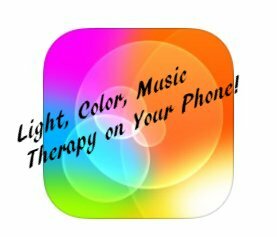 The app's name is "ColorBoost", and meant to be applied for depression and anxiety, through emitting powerful colored light, color and sound. The treatments which are derived from health practitioner sciences, consists of a number of sessions - color therapy (chromotherapy) - on a daily basis to achieve and promote Qi-balance and a postivie outlook. The company states that "The powers of color and light have long been known for their restorative powers. With this app anyone can no implement a therapeutic regimen with their phone." For running a color therapy, the app enables you to select colors you like such as white, green, orange, red, pink, purple, blue, green. The developers continue saying that their app's "innovative "color, light and sound" approach to therapy, the preferred choice of colors and music will be easily absorbed. Each ColorBoost therapy session takes only 10 minutes. Session settings include "Energizing", "Calming" and "Relaxation". As the session begins, the user selects positive music and colors to start. Throughout the session, colors will interchange gently and slowly during the session, creating a sense of calm for the user. Users will feel more energetic, refreshed and confident after. Regular therapy is recommended for long-term improvements." Here's more on the ColorBoost app. The ColorBoost app is available in Apple's App store. The app itself is free, the socalled 'in-app therapies' can be purchased. See Here for more on light therapy devices to de-stress, delax and relieving depression/anxiety.